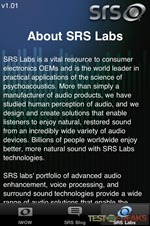 SRS labs are known for their audio technologies found in numerous consumer products including HDTV’s. 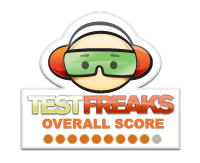 In fact the SRS logo can be found on numerous HDTV boxes and stickers affixed to HDTV’s. 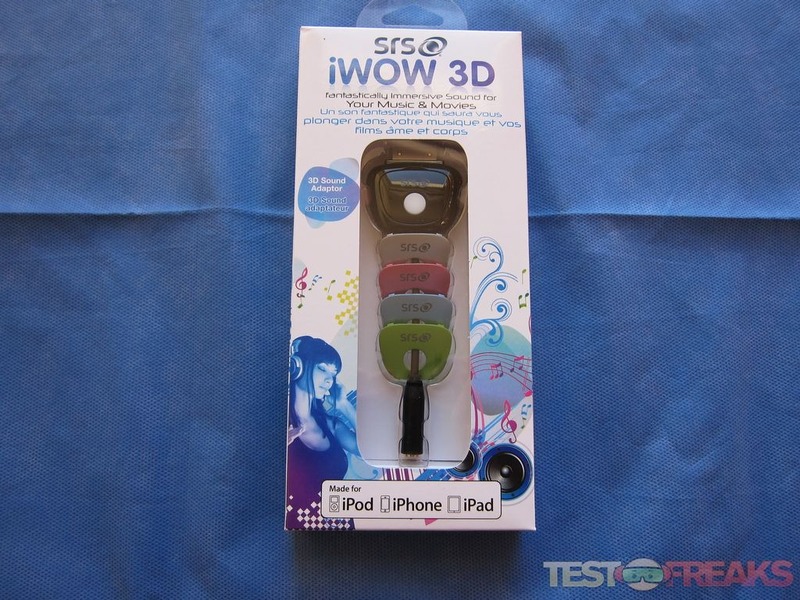 Recently they have come out with the SRS iWOW 3D which is an audio adapter that attaches to your iPhone, iPod or iPad to create a three-dimensional soundstage for your audio and video playback. 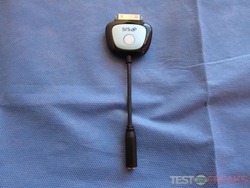 At the most recent Pepcom press event the folks from SRS were kind enough to provide us with a sample. This audio adapter can be used by itself or in conjunction with a free iOS app. 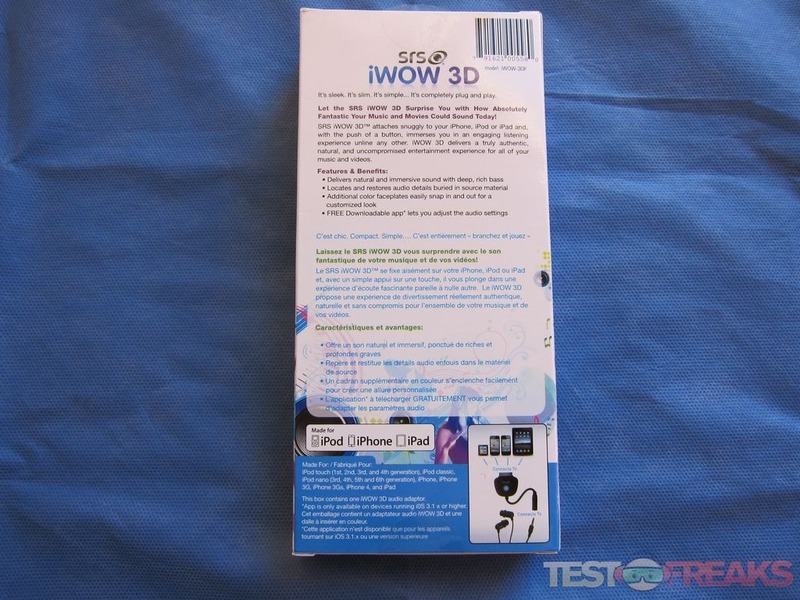 The SRS iWOW 3D comes packaged in a white cardboard box with a clear window revealing the iWOW 3D dongle along with 4 colorful faceplates for the device. The back of the package provides a description of the features and benefits of the device in both English and French. 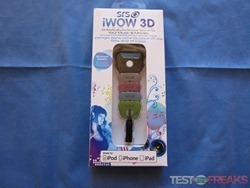 Opening the package refine the iWOW 3D, five colored faceplates and a user manual. The face plate covers come in black, red, green, light blue and silver. 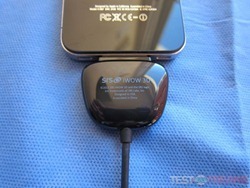 The iWOW 3D is an all-black device with a 30-pin Apple connector at one end along with a black trapezoid shaped body. The face plate cover is removable and the device comes with the black version pre-attached. 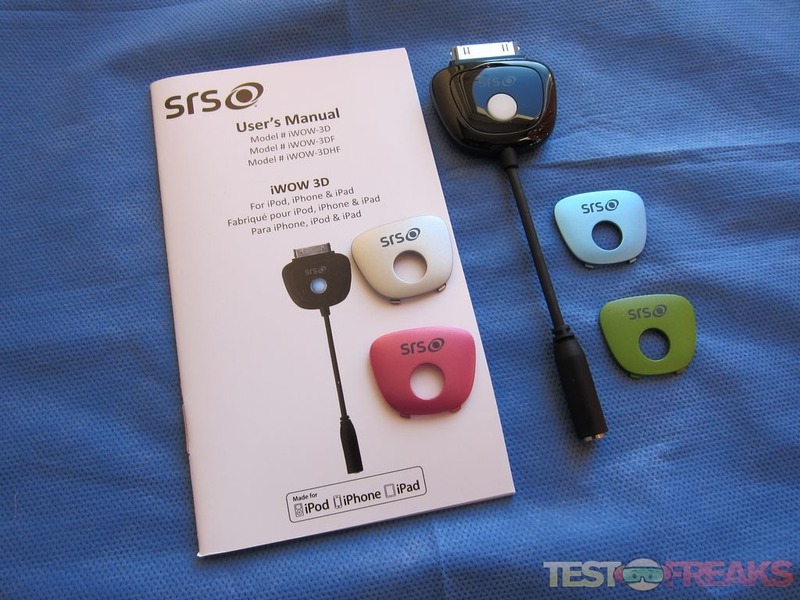 The SRS logo is found in the middle of the face plates with an opening for the white activation button. Obviously the various face plates are for personalization of the iWOW 3D. 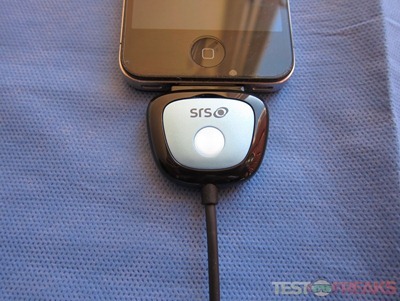 On the back of the device is the name and SRS logo. 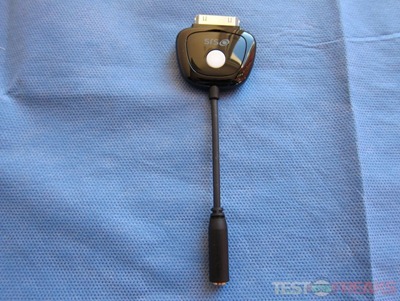 The audio adapter measures 4 1/2 inches in length and has a 3.5 mm headphone connector at the end opposite the main body. 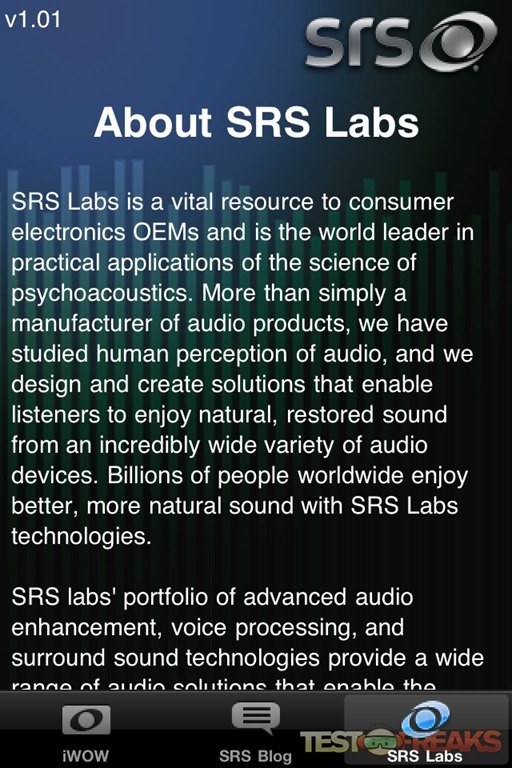 SRS offers an optional free iOS app to help tailor the listening experience. 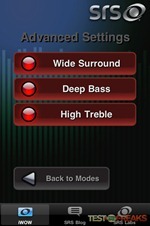 This app is not needed to use the audio adapter but it does allow some finer customization of the playback audio. If you haven’t already downloaded the free app your iOS device will kindly remind you that it is an available option; however it is not required to use the while iWOW 3D audio adapter. 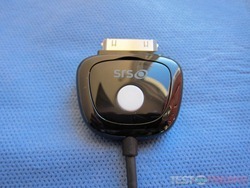 The white button will light up when the SRS iWOW 3D is actively filtering one’s music. Pressing this button will toggle the iWOW 3D on and off. 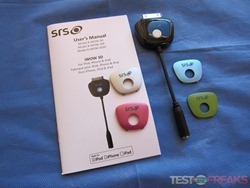 For testing the SRS iWOW 3D an iPhone 4S and an iPad 2 were used. Luckily my vacation coincided with my testing of the iWOW 3D thus I had plenty of opportunity to use it while listening to music and watching videos. After spending a copious amount of time using the SRS device all I have to say is I know why it is called the iWOW 3D because when you first listen to it you will say “wow”. 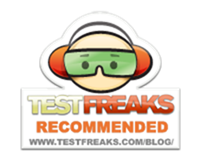 This audio adapter creates such a rich, deep and clear soundstage that you will be truly amazed by. 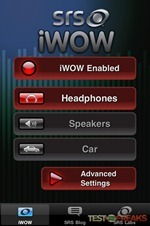 Listening to audio through the iWOW 3D is like a veil is lifted off your ears. The unfiltered audio sounds flat and lifeless compared to the enhanced audio from the SRS device. Songs that I listened to for years sounded brand-new using the iWOW 3D. For instance Jack Johnson’s Flake sounded phenomenal; the steel drums at the beginning of the song were heard like never before. Heavier music such as Dream Theater’s Lost But Not Forgotten sounded almost orchestral in its presentation when played through the iWOW 3D. Not all music sounded pristine as some bass heavy songs were distorted by the filtration through the iWOW 3D. This was a rare occurrence but songs such as the Black Keys Everlasting Light were too muddy with the SRS audio adapter. Thankfully this too can be addressed with the free iOS app. The SRS iWOW app features three options on the bottom of the main screen. 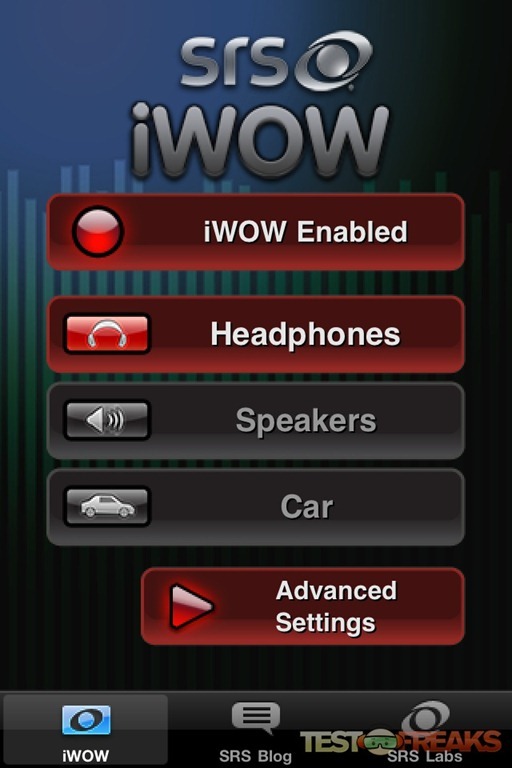 The iWOW icon allows the device to be toggled on or off as well as setting the playback device to headphones, speakers or car. In the Advanced Settings screen you can toggle the Wide Surround, Deep Bass and High Treble options. 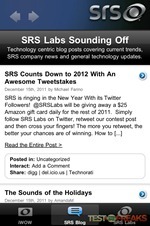 The other two choices in the app are to view the SRS blog or to see more information about SRS labs. 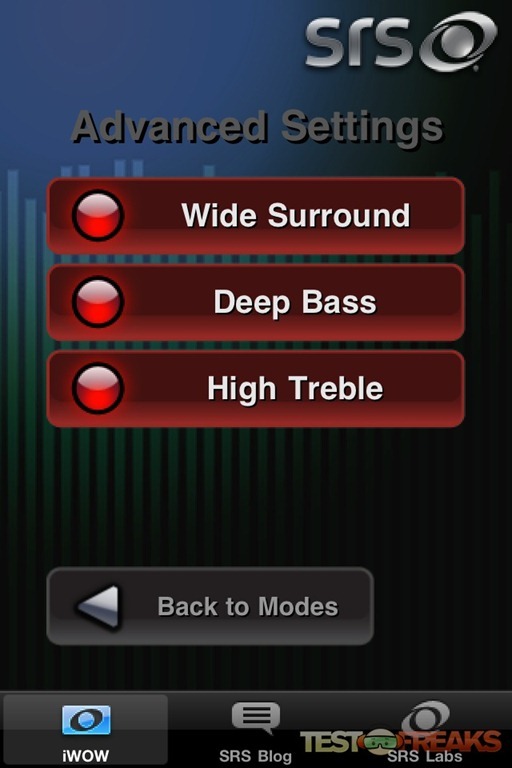 It is really not necessary to download this app to enjoy the iWOW 3D but the ability to toggle the surround bass and treble settings are helpful especially with certain types of music. 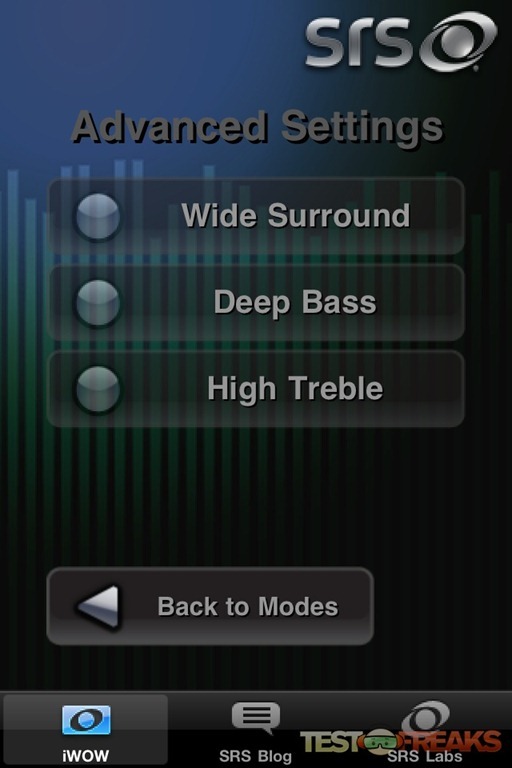 The example I mentioned above with the Black Keys song was helped by turning off the Deep Bass setting. My one issue with the audio adapter was that only one use can listen to the iOS device with the iWOW 3D plugged in. During my flight home my wife and I wanted to watch a movie together on my iPad 2 and we sadly found out only one headphone input was active. This is probably an issue with iOS device more than the SRS product; still it was frustrating to find this out on the trip home. In terms of battery drain, the SRS iWOW 3D does decrease the iOSes battery life. During my testing it was not really noticeable but according to the SRS website it is around 18%. 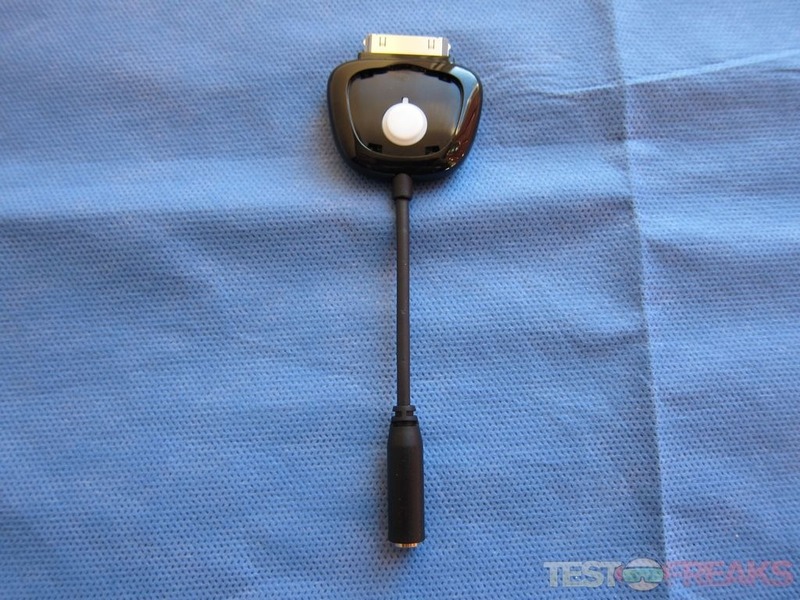 WARNING: Please make sure that the Bluetooth Headphones / Speakers are disconnected before you attach the iWOW adapter to your Apple Device. This is to prevent an overload of the circuitry trying to gain control of the Audio path from the BT device. Also the dongle that attaches to the Apple dock connector is slightly bulky and does make the iOS devices less streamlined. 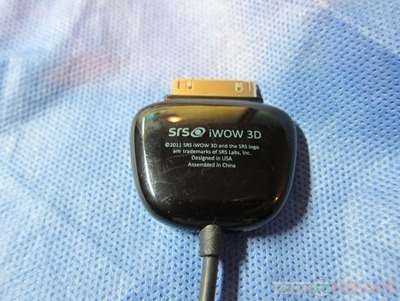 I would not use the SRS iWOW 3D while working out as it may torque on the connector if it is kept in one’s pocket. If you want to make your iOS audio playback experience much richer for a low cost then the iWOW 3D is definitely a great option. 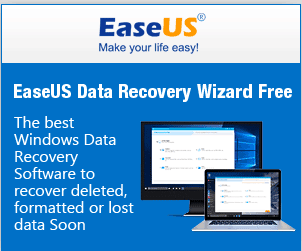 While it is a relatively small accessory it does add some bulk to the user’s iOS device. 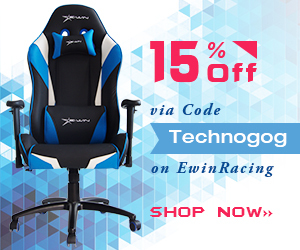 It is ideal for watching videos where the user is resting in one spot. 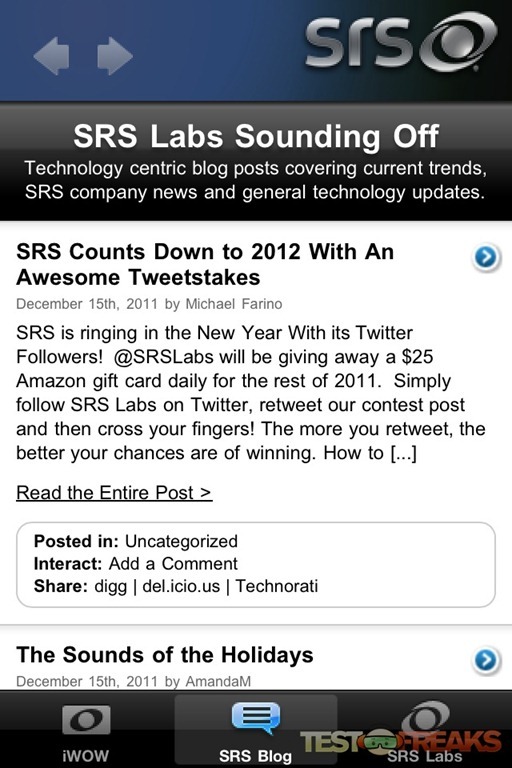 Overall I would definitely recommend the SRS iWOW 3D for any iOS user. 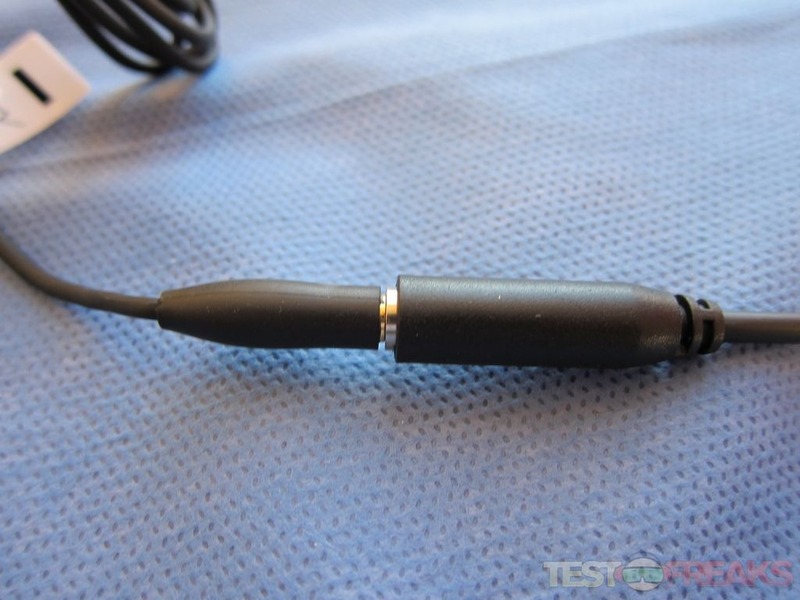 You’ll truly be impressed by the sound coming through your headphones or speakers using this audio adapter.